As a special educator, one of the most important parts of my job is to create a positive relationship with my students’ parents. Although achieving this goal can be difficult at the beginning of the year with a million other things to do, creating this relationship can make or break your year. Parents of students with special needs are used to been told year after year what is wrong with their child, what their child cannot do, etc. Sometimes, it is very rare that they hear anything positive about their child. In college, when I “learned” about IEP’s, I remember all of my professors stating over and over again that you should always try to state a strength before a weakness, but sometimes that can be hard to do on a high-needs student. Why wait until the IEP meeting to praise a student? Send a good note home. 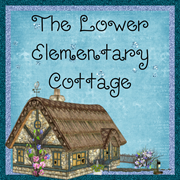 Send an e-mail about something the child did that day that impressed you. Write it in the student’s planner or communication notebook. These small steps that only take a minute of your day, go miles in a parent’s heart. Also, I like Sarah’s post on how to prepare parents for IEP meetings. My district does not require pre-meetings with parents, but I think it is a great idea! Sometimes in these meetings, we as special educators fail to express how special the student really is or highlight a few “good things” because we are so concerned with the data, goals, minutes, etc. Obviously the student has weaknesses, or they wouldn’t have an IEP. Although the data is VERY important, because we are working to help the student make progress, don’t forget in that meeting that you are talking about someone’s son or daughter in front of a bunch of strangers. I encourage you to take the time to encourage your parents. P.S. 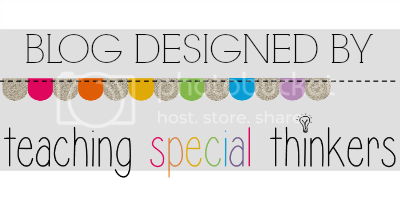 Here is a little freebie I use to stay organized pre/during/post IEP meetings. You may have to make a few tweaks to fit your county. It is editable! 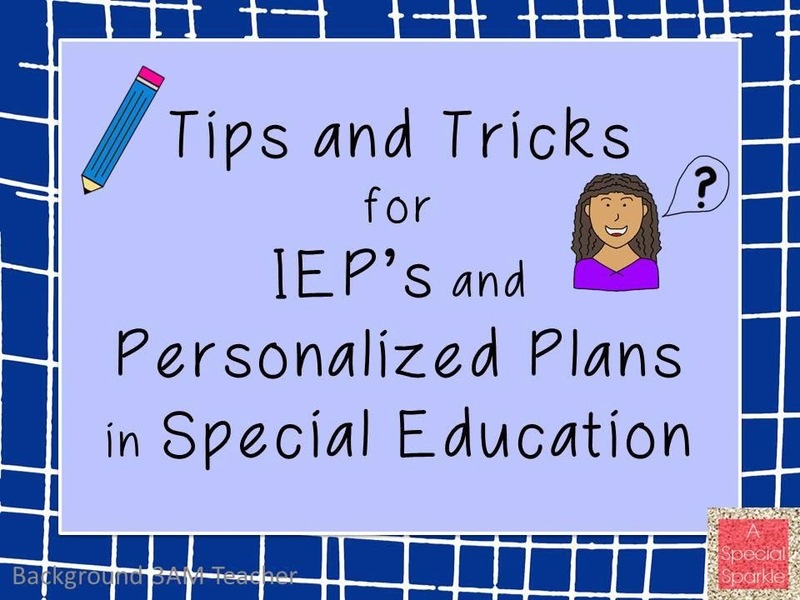 There are lots of things you need to think about when preparing an IEP. What can the student do and what does he or she need to do? What curriculum goals am I required to write for common core or state curriculum needs? What do the parents want us to work on? Sarah did a nice post on some of these questions. So today I want to focus specifically on 5 things you need to think about before you write the actual goal itself….5 questions to ask in addition to the standards of is it measureable, is it clear and is it related to the present level of performance. 1. Is this a goal that has been written before? I realize this sounds a bit silly, however, I see many IEPs where a child has the same or similar goals every year. This is a good indication that the student is not making the progress he or she should be, or we are not writing goals that are really appropriate to his skills. I realize many times that teachers inherit IEPs and goals from others. However, if we have been teaching this skill or it was taught before, make sure you know what the problem was with the student achieving it before we repeat it. Then think about a realistic goal will be and what you are going to do differently to change the outcome to be successful. 2. Is this an enabling goal? A goal that enables is one that opens doors for the individual. They can be academic, life skills, vocational or any other area of skill, but the key is that it enables the student to be more independent and expand horizons. For instance, for some students a phonics goal is an enabling goal because it opens doors and greatly expands their ability to read new material. For others who are not phonics students, learning to read functional environmental words would be an enabling goal that opens doors to being able to function more independently in a variety of environments. I’ve written more about enabling goals here. 3. Does it teach to the next environment? What skills does this student need for the next setting he or she will be in? If he is a preschooler, what skills will he or she need to develop to be as successful as possible in kindergarten? If he’s a high school student, what skills does he need for college and/or the work force? Even students graduating with a high school diploma may need goals that are addressing social skills on the job, executive functioning, or independent living skills in order to be successful in their next environment. 4. HOW are you going to teach the skill? This is important not just because you are going to have to teach the skill, but because it should affect how you write the goal. For instance, if I write a goal that uses the steps of performing a skill as the objectives, then I need to use those steps to teach it and each step has to be mastered. So for the example on the left of the graphic below, I might have a goal that is written with objectives--will independently turn on the water, get his hands wet and get the soap; will independently wash his hands through rinsing; will independently wash his hands and dry them. 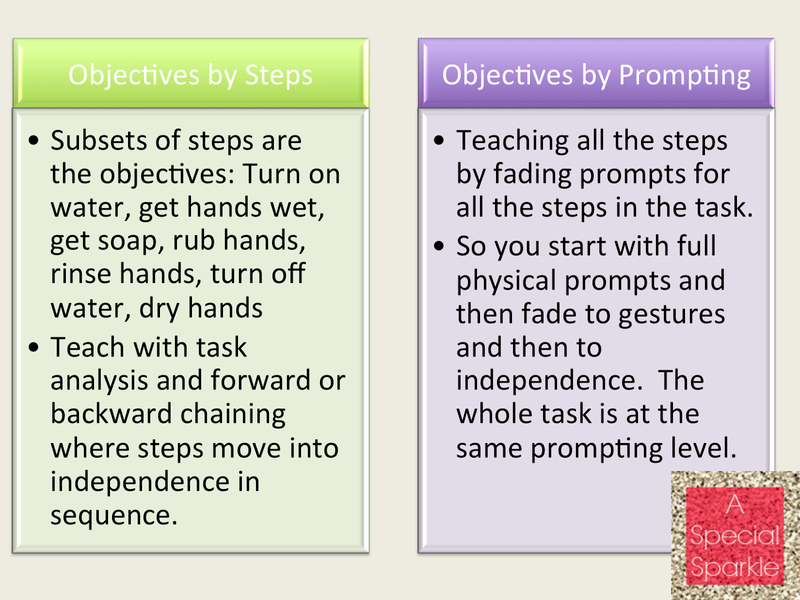 In the example on the right, it might be that he will complete the handwashing sequence with physical prompts. He will complete the handwashing sequence with gestural prompts. He will complete the handwashing sequence independently. How I write the goal will ultimately effect how I will teach the skill so that I can show mastery the way the goal is written. 5. How are you going to measure it? This goes beyond just checking the “teacher collected data” box on the IEP form. If you don’t know how you are going to measure it, it’s going to be hard to track. Write the goal with thoughts about how you are planning to measure it. Can you use permanent product or work product? Is it something that you are writing in a way that you have to measure it every day? If I write a goal that John will initiate a social interaction with a peer during recess on 8/10 opportunities—what does an opportunity to initiate an interaction look like? Instead, if I write it as “John will initiate a social interaction with a peer at least 3 times during a 15-minute unstructured activity on 4/5 days” I just have to have a baseline of how many initiations take place during the first 15 minutes of recess and then count them to collect data. So those are some things to think about as you write the goal itself. What other issues do you make sure to think about when writing goals? As SLPs we often worry that the time we give students is not enough. Thirty minutes twice per week? It's just not enough when it stands alone. Speech and language goals are most likely to be met when carryover is supported at home and in the regular education classroom. I think you can see where this post is going. Don't run away! I'm not adding something else to your list! I'm just giving you ways you can help support speech and language goals in your classroom by just being cognizant of the goals. Today I want to share 3 quick ideas for supporting articulation. First, a quick review of articulation in general. Articulation errors are errors in speech sound production. This could be when a child omits the sound (ie: nake/snake) or distorts the sound (ie: wabbit/rabbit). Some errors are developmentally appropriate, but it general most kids should have all sounds by age 8. Your Speech Language Pathologist should have clarified which sounds your student is working on. SLPs use multi-sensory cues to instruct students. We start with the sound by itself, then work on the sound in words, followed by sentences. Reading and conversation are the last levels of mastery. ONE:: Small group reading. Reading is a great time to work on awareness of sounds. When you are working in small groups with your students, introduce the book or passage to be read. Take a second to remind your speech student that there might be lots of ___ sounds in this book. If you're working on a copied paper, you can have the student highlight their sounds. Gentle reminders that are discrete like a tap on the desk can be used to remind the student without calling a lot of attention to the child's speech. 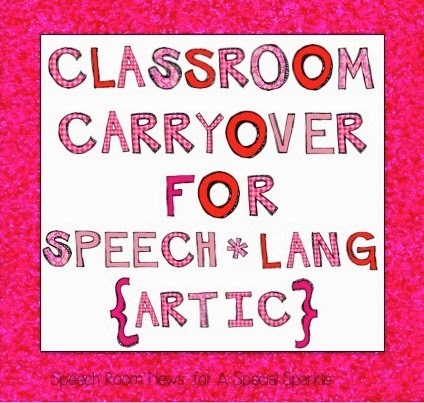 TWO:: Phonological Awareness/ Rhyming Activities. If you're a primary teacher you're doing a lot of word work on a daily basis. This is one great way to incorporate articulation words. For example, if your student is working on the 'S' sound and your class is targeting rhyming. Take the 'S' pictures cards and ask your student to produce rhymes for those words (SUN/FUN, SING/RING). 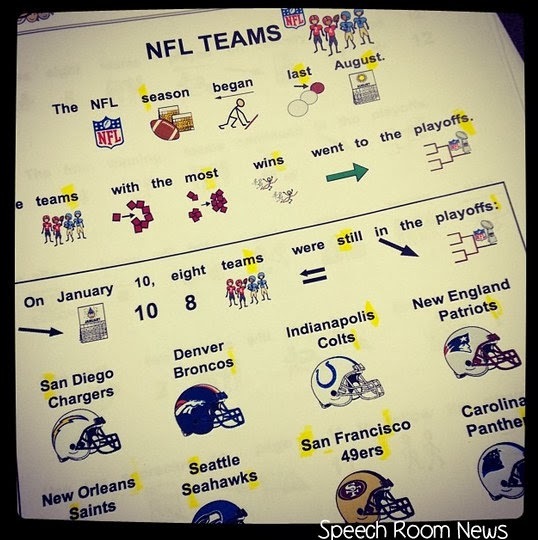 You can ask your friendly school SLP for articulation cards or download some from TpT. THREE:: Non-verbal Reminders. Develop a signal with your student to use as a non-verbal reminder. Are they working on the /k/ sound? Your signal could be to touch your throat. Use this as a reminder before he/she speaks to the group. I've also used simple reminders taped to students' desks as reminders. A post it note is a simple solution. I hope these three simple ideas give you an idea some simple ways to help your student with their articulation goals. Sometimes the most stressful part of writing an IEP is communicating with the parents! Here are a few things that I do that make my annual reviews much less stressful! This post is based on the annual review process in New York State. Some terms and components of an IEP may differ from other states. To ensure that we are on the same page, I am including a glossary with some of the terms that are used in New York State. Annual Review: Annual meeting to discuss student's progress and finalize documents for the upcoming school year. Pre-CSE Meeting: A meeting with the teacher and parent to discuss recommendations for next year (done over the phone or in person). Long before I begin writing my IEPs, I always reach out to the parents to let them know that the process of Annual Reviews has begun. I try to give them as much notice as possible because it is difficult for parents to take time off of work to attend their child's CSE or CPSE meeting. As soon as my district notifies me of my Annual Review date, I notify the parents...sometimes 4 months in advance! After I notify the parents, I send home a packet for them to complete. A few years ago, New York State added a section to our IEPs that reads "Consideration of student needs that are of concern to the parents". This is included in Academic, Social and Physical PLEPS of the IEP. It gives parents an opportunity to have a statement regarding their child's academic, social and physical needs. It is required that if a parent expresses any concern or comments about their child's education then it must be in the IEP document. I take exactly what the parents write on my input form and type it verbatim into the document. Parents don't like being surprised, and neither do teachers! By meeting with the parents before you go to annual reviews, you are able to discuss your recommendations and concerns and make sure that you and the parents are in agreement with what you are recommending. Parents don't want to find out that their child is regressing in front of a group of strangers. They want to be able to talk intimately and privately about it with you, the teacher. Typically when I get to my annual review meetings, there are no surprises or issues moving forward and we meet very briefly to finalize documents because the parents and I have already discussed all of the details on our own time. I will often have a summer survival kit or a folder of materials to give to the parents at the annual review meeting. This is typically the last time I will meet with the parents, so it is a good time to hand out a summer reading journal or a list of books to read on vacation. Parents appreciate all of the tips and tricks you can share! Let me know if you have any questions! Happy IEP writing!! This time of year is always very busy with working on IEPs and other personalized plans for students in special education. The Sparklers and I would like to take this opportunity to share some ideas to help make this process easier. In my experience by mid-march I'm up to my eyeballs in paperwork! I'm at a private school so our Personalized Plans are a little different than an IEP, but the content and purpose are the same. Plus, I've worked in public school for years too, so I've seen that side of things as well. There is always so much to do! 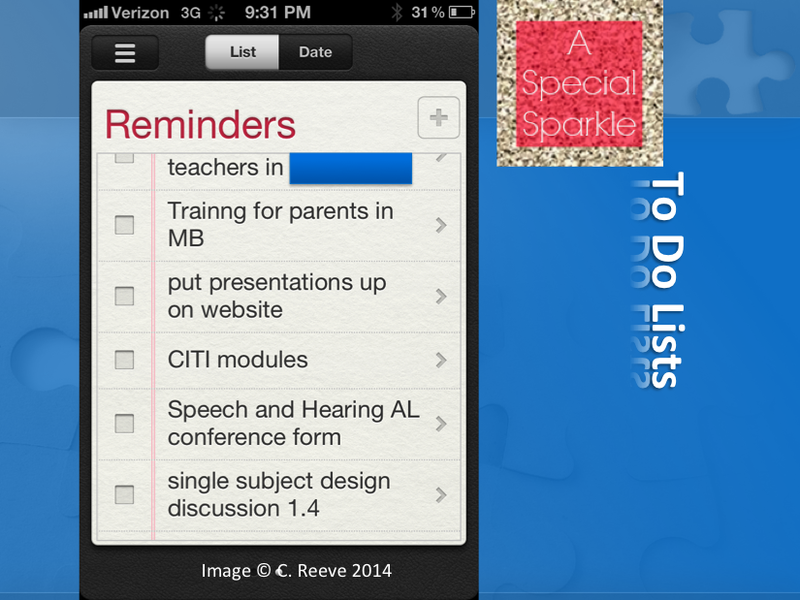 Meetings, goal updates, assessments, conferences...the list goes on and on! Now the question... where do I begin?! Make a calendar!! I like having a printed copy that has a full month with all the meetings and paperwork due dates. When you have several students with paperwork due around the same time, it's easy to mix up days or forget tasks all together! For confidentiality I've used colored pens for different students instead of writing names on a posted calendar. Prioritize! For a couple years I had 2 siblings who were notoriously sick or just plain absent excessively. This made assessment nearly impossible to get done on time. The first year I had them, their assessments weren't done in time for their IEPs because they had both gotten fevers that lasted for days. I learned my lesson and always did their paperwork first and the longer assessments on days I knew they were healthy and happy, even if it wasn't due for multiple weeks. In general I like to do longer assessments first because shorter ones are easier to squeeze in if you happen to fall behind. Find the positive!! Those little blurbs that talk about all the great things the child can do are immensely important! Don't forget that parents of kids in special ed. are always told all the things their child CAN'T do. It's important to show them all the things they CAN DO! I love to start meetings with these little anecdotes to set the tone of the IEP or conference meeting. Compare Work Samples! For some students, progress is very slow and hard to measure. I know I've had students who appear to have made zero growth, but when you compare work samples you can see things such as spacing, capitalization, and letter formation improving, even if spelling has not made strong growth. These are excellent to show (if you have time) during an IEP so the parents and the rest of the team can see small progress on challenging goals. What's the most important goal? When creating a new IEP or new goals to replace old ones in an IEP, it's often a challenge to decide what makes a good goal. The priority should be on goals that will help students achieve long term success. Some students have so many areas of need that it's hard to pick just one. I like to map it out in a hierarchy to identify which things are most important. For instance, I often choose sight word goals before decoding goals because younger students need to feel those reading successes that come from predictable sight-word readers. While both are crucial, and ideally I'd have both goals if the team agrees, I focus on things that will foster long term motivation and success for my student. Is it achievable? When creating a goal, it is essential that it is within the realm of success for the student. If a child cannot decode any CVC words, the goal should not be to decode long vowel pattern words by next year. A more realistic goal would be CVC and CVCC words. If the child achieves it sooner, then you can start working on more challenging skills. Find Successes! One of the best ways to create or meet a goal is to find areas where the child is successful and use them to your advantage. If a child has wonderful memorization skills, perhaps flashcards are a great way to work on a math goal. If a child is a visual learner, find ways to include visual cues and visual responses to lessons. I have students with dyslexia that are auditory learners, so I play songs (I can't sing) to help them remember concepts. There are so many more ideas to come. Be on the look for future posts from our authors on this topic! As we head back to school and make new resolutions, one of many people’s resolutions is to get organized. Many of us are thinking about being organized at home or being organized as the teacher, but it is also a great time to think about a resolution to help your students be organized. 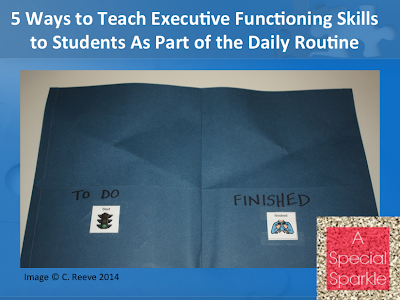 Many students with disabilities, and many without an identified disability, struggle with executive functioning abilities. I talked about EF skills in an earlier post. 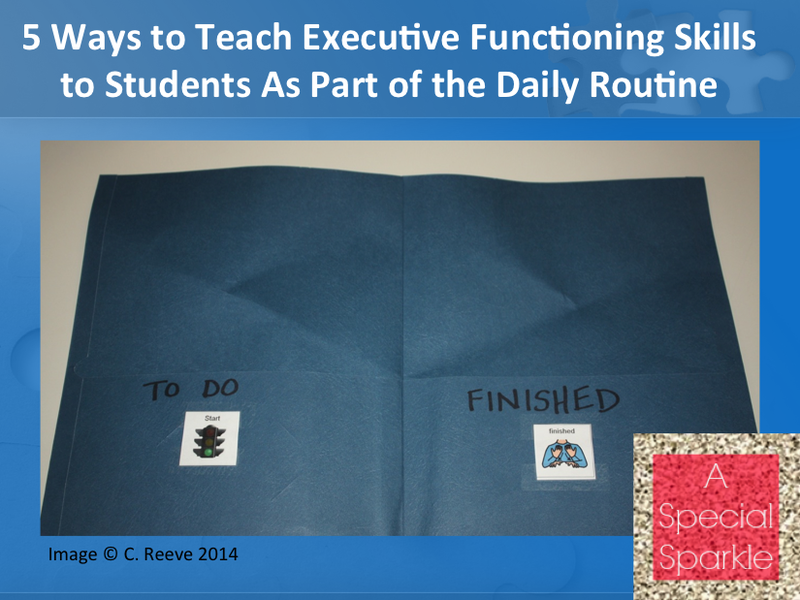 I thought today I would highlight some strategies that can be built into routines of the classroom to promote EF skills for all students, including those who struggle with it. 1. In younger grades we tend to tell the students how to organize their materials. In secondary grades we expect them to have this skill already, but many students don’t as the work and materials become more complex and plentiful. Plus in secondary they start to move around and have to track their materials. For many students setting up systems early on is sufficient for them to learn a strategy. However, for students with EF difficulties, they probably need more practice and more explicit instruction. In elementary grades, instead of just telling students how to organize their materials (e.g., put this in your folder to go home), ask them where it should go and have a way for them to show you the result. You could use response cards to have them pick where the material should be put or just have them hold up their folders to let you know. This then lets you, as the teacher, know who needs more assistance and practice with the skill. 2. Have a strategy wall or notebook that the students can refer to of organization strategies. Have them brainstorm strategies they can use to organize materials and use them. This could include anything from write yourself a note to put it in your calendar. Have all the students work together to brainstorm about strategies for specific situations and add new ideas to the wall. When they need to organize or remember something, have them use the wall to generate ways to do it (e.g., how can you remember to ask your parents to sign your permission slip for the field trip and bring it back to school?). 3. Discuss individual differences of organizing materials with the class as a whole. This helps students discover what strategies work for them and what don’t. It’s important to remember that not every strategy is effective for every individual. Some people need a paper and pencil list or calendar. Others do better if it’s on a tablet or phone or computer so they always can access it (often because they lose the paper copy). Have a discussion periodically in class about what students feel is working and what is not. Returning from break is a great time to have this type of talk with the class or with individual students. 4. Think about your routines throughout the day and whether they are used consistently. Do you assign homework frequently? Is it written in the same place each day for the students to write it in their notebooks? Do the students have a designated place to write their assignments in their calendar or notebook? Could you write a checklist for the end-of-the-day routine or the arrival routine in you classroom? If you aren’t sure, try it. Then use that checklist for the students who are struggling. Think about writing it on the board for a while after the break so that students get back in the groove with it. 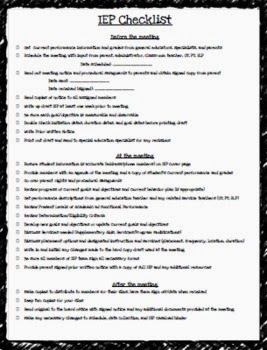 Some students may also benefit from having this as a written checklist at their desk beyond the first week back. Rae did a great post about the importance of routines at the end of the year and returning. If you have students who are struggling to turn their homework in or bring their papers back from their parents, take a moment and think about your routines and systems and whether they are clear. 5. Finally, one of the most important elements of any strategy for EF skills is to practice it and keep at it for long enough for it to become a habit. It’s easy to develop a system and leave it before it becomes part of the daily routine. If I had a dime for every calendar system I’ve used just in my professional career, I could….well at least buy another organizer system. It’s easy to abandon strategies too early and think they aren’t working. There are lots of articles and books written with folklore about how long it takes to make or break a habit. In truth it depends on the habit, the extent of the change, and the person doing the change. However, if you have ever tried to change your eating pattern, exercise more, or any other resolution, you know that it goes well for a bit and then it may stop working. This doesn’t mean you throw the system out…but it might mean you need to tweak it a bit. Forming a habit takes time and repetition. It also means breaking the old habit (e.g., shoving all my papers in a backpack instead of taking time to put them in the folders). The more times you repeat the new behavior and it pays off, the more likely you are to do it again. Think about how to motivate the student to use the new strategy and keep a reminder system in place long enough for it to truly become a routine. These are just some ideas for how to encourage EF skills in all your students, which will in turn help those who struggle with it the most. There are many more so please share any other ideas you have in the comments. I’ll be back soon with a post about how to teach flexibility which is a topic that is particularly salient for some of our students on the autism spectrum.